Since at least 2001, the Middle East has been the focal point of American foreign policy and military strategy. The shock of 9/11 brought the US and its allies first into Afghanistan and then, via grim momentum and fraught logic, into Iraq. But the United States has of course been engaged in the Middle East in one way or another continuously since the end of the Second World War, as have its Western partners and, indeed, Russia. 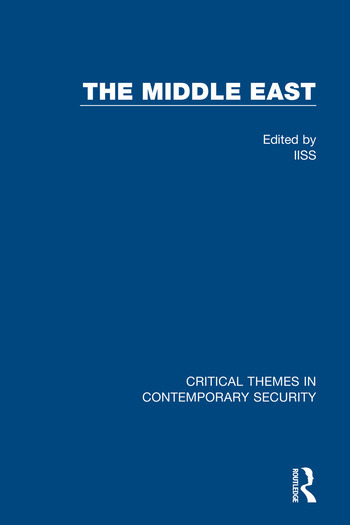 The articles in this collection reflect this history: they are, in many ways, a record of the preoccupations of external actors who have shaped the region. On the other hand, they reflect, too, the deep divisions – and often the disorder – of the Middle East, its states, its non-state entities, and its people. Bruce Riedel, ‘The Return of the Knights: al-Qaeda and the Fruits of the Middle East Disorder’, Survival, 49, 3, 2007, pp.107-120. Jonathan Stevenson, ‘Echoes of Gunfire: Bin Laden, the US and the Greater Middle East’, Survival, 53, 3, 2011, pp.11-18. Donald Holbrook, ‘Al-Qaeda and the Rise of ISIS’, Survival, 57, 2, 2015, pp.93-104. Vicken Cheterian, ‘ISIS and the Killing Fields of the Middle East’, Survival, 57, 2, 2015, pp.105-118. James Fromson & Steven Simon, ‘ISIS: The Dubious Paradise of Apocalypse Now’, Survival, 57, 3, 2015, pp.7-56. Ariel I. Ahram, ‘Sexual Violence and the Making of ISIS’, Survival, 57, 3, 2015, pp.57-78. Nelly Lahoud, ‘Can Women Be Soldiers of the Islamic State?’, Survival, 59, 1, 2017, pp.61-78. Aaron Brantly, ‘Innovation and Adaptation in Jihadist Digital Security’, Survival, 59, 1, 2017, pp.79-102. Hal Brands & Peter Feaver, ‘Was the Rise of ISIS Inevitable?’, Survival, 59, 3, 2017, pp.7-54. James Dobbins & Seth Jones, ‘The End of a Caliphate’, Survival, 59, 3, 2017, pp.55-72. Andreas Wimmer, ‘Democracy and Ethno-Religious Conflict in Iraq’, Survival, 45, 4, 2003, pp.111-134. Lawrence Freedman, ‘War in Iraq: Selling the Threat’, Survival, 46, 2, 2004, pp.7-49. David C. Hendrickson & Robert W. Tucker, ‘Revisions in Need of Revising: What Went Wrong in the Iraq War’, Survival, 47, 2, 2005, pp.7-32. Hilary Synnott, ‘State-Building in Southern Iraq’, Survival, 47, 2, 2005, pp.33-56. Steven E. Miller, ‘The Iraq Experiment and US National Security’, Survival, 48, 4, 2006, pp.17-50. Steven Simon, ‘America and Iraq: The Case for Disengagement’, Survival, 49, 1, 2007, pp.61-84. Toby Dodge, ‘The Causes of US Failure in Iraq’, Survival, 49, 1, 2007, pp.85-106. Christopher J. Fettweis, ‘On the Consequences of Failure in Iraq’, Survival, 49, 4, 2007, pp.83-98. Riedar Visser, ‘Historical Myths of a Divided Iraq’, Survival, 50, 02, 2008, pp.95-106. David Hannay, ‘Three Iraq Intelligence Failures Reconsidered’, Survival, 51, 6, 2009, pp.13-20. Toby Dodge, ‘The US and Iraq: Time to go Home’, Survival, 52, 2, 2010, pp.129-140. Safa Rasul al-Sheikh and Emma Sky, ‘Iraq Since 2003: Perspectives on a Divided Society’, Survival, 53, 4, 2011, pp.119-142. Toby Dodge, ‘Iraq’s Road Back to Dictatorship’, Survival, 54, 3, 2012, pp.147-168. Daniel Deudney & G. John Ikenberry, ‘Realism, Liberalism and the Iraq War’, Survival, 59, 4, 2017, pp.7-26. Seth G. Jones, ‘Averting Failure in Afghanistan’, Survival, 48, 1, 2006, pp.111-128. Adam Roberts, ‘Doctrine and Reality in Afghanistan’, Survival, 51, 1, 2009, pp.29-60. Steven Simon & Jonathan Stevenson, ‘Afghanistan: How Much is Enough?’, Survival, 51, 5, 2009, pp.47-67. Malou Innocent, ‘Should America Liberate Afghanistan’s Women?’, Survival, 53, 5, 2011, pp.31-52. Austin Long & Andrew Radin, ‘Enlisting Islam for an Effective Afghan Police’, Survival, 54, 2, 2012, pp.113-128. Paul Miller, ‘The US and Afghanistan After 2014’, Survival, 55, 1, 2013, pp.87-102. Amin Saikal, ‘Afghanistan’s Geographic Possibilities’, Survival, 56, 3, 2014, pp.141-156. Theo Farrell & Michael Semple, ‘Making Peace with the Taliban’, Survival, 57, 6, 2015, pp.79-110. Dalia Dassa Kaye & Frederic M. Wehrey, ‘A Nuclear Iran: The Reactions of Neighbours’ Survival, 49, 2, 2007, pp.111-128. Volker Perthes, ‘Ambition and Fear: Iran’s Foreign Policy and Nuclear Programme’, Survival, 52, 3, 2010, pp.95-114. Robert E. Hunter, ‘Rethinking Iran’, Survival, 52, 5, 2010, pp.135-156. Dana H. Allin & Steven Simon, ‘Obama’s Dilemmas: Iran, Israel and the Rumours of War’, Survival, 52, 6, 2010, pp.15-44. Dina Esfandiary & Mark Fitzpatrick, ‘Sanctions on Iran: Defining and Enabling "Success"’, Survival, 53, 5, 2011, pp.143-156. James Dobbins, ‘Coping with a Nuclearising Iran’, Survival, 53, 6, 2011, pp.37-50. Peter Jones, ‘Succession and the Supreme Leader in Iran’, Survival, 53, 6, 2011, pp.105-126. Banafsheh Keynoush, ‘Iran After Ahmadinejad’, Survival, 54, 3, 2012, pp.127-146. Seyed Hossein Mousavian, ‘Globalising Iran’s Fatwa Against Nuclear Weapons’, Survival, 55, 2, 2013, pp.147-162. Peter Jones, ‘Hope and Disappointment: Iran and the Arab Spring’, Survival, 55, 4, 2013, pp.73-84. Erica Borghard & Mira Rapp-Hooper, ‘Hizbullah and the Iranian Nuclear Programme’, Survival, 55, 4, 2013, pp.85-106. Shahram Chubin, ‘Is Iran a Military Threat?’, Survival, 56, 2, 2014, pp.65-88. Avis Bohlen, ‘Iran: An Opening for Diplomacy?’, Survival, 57, 5, 2015, pp.59-66. Michael Wahid Hanna & Dalia Dassa Kaye, ‘The Limits of Iranian Power’, Survival, 57, 5, 2015, pp.173-198. David Hannay & Thomas R. Pickering, ‘Building on The Iran Nuclear Agreement’, Survival, 59, 2, 2017, pp.153-166. Walter Posch, ‘Ideology and Strategy in the Middle East: The Case of Iran’, Survival, 59, 5, 2017, pp.69-98. Marc Lynch, ‘America and Egypt After the Uprisings’, Survival, 53, 2, 2011, pp.31-42. Ibrahim A. Karawan, ‘Politics and the Army in Egypt’, Survival, 53, 2, 2011, pp.43-50. Ewan Stein, ‘Revolution or Coup? Egypt’s Fraught Transition’, Survival, 54, 4, 2012, pp.45-66. Bruce Jones, ‘Libya and the Responsibilities of Power’, Survival, 53, 3, 2011, pp.51-60. Saskia van Genugten, ‘Libya After Gadhafi’, Survival, 53, 3, 2011, pp.61-74. Ben Barry, ‘Libya’s Lessons’, Survival, 53, 5, 2011, pp.5-14. Douglas Barrie, ‘Libya’s Lessons: The Air Campaign’, Survival, 54, 6, 2012, pp.57-65. Christopher S. Chivvis, ‘Libya and the Future of Liberal Intervention’, Survival, 54, 6, 2012, pp.69-92. Florence Gaub, ‘A Libyan Recipe for Disaster’, Survival, 56, 1, 2014, pp.101-120. Christopher S. Chivvis, ‘Countering the Islamic State in Libya’, Survival, 58, 4, 2016, pp.113-130. Wolfram Lacher, ‘Was Libya’s Collapse Predictable?’, Survival, 59, 2, 2017, pp.139-152. Steven A. Cook, ‘Turkey’s War at Home’, Survival, 51, 5, 2009, pp.105-120. F. Stephen Larrabee, ‘Turkey’s New Geopolitics’, Survival, 52, 2, 2010, pp.157-180. Henri J. Barkey, ‘Turkey’s Moment of Inflection’, Survival, 52, 3, 2010, pp.39-50. F. Stephen Larrabee & Gonul Tol, ‘Turkey’s Kurdish Challenge’, Survival, 53, 4, 2011, pp.143-152. F. Stephen Larrabee, ‘Turkey’s New Kurdish Opening’, Survival, 55, 5, 2013, pp.133-146. Behlül Ozkan, ‘Turkey, Davutoglu and the Idea of Pan-Islamism’, Survival, 56, 4, 2014, pp.119-140. Henri J. Barkey, ‘Turkey’s Syria Predicament’, Survival, 56, 6, 2014, pp.113-134. Eliot A. Cohen, Michael J. Eisenstadt & Andrew J. Bacevich, ‘Israel’s Revolution in Security Affairs’, Survival, 40, 1, 1998, pp.48-67. Nomi Bar-Yaacov, ‘New Imperatives for Israeli-Palestinian Peace’, Survival, 45, 2, 2003, pp.72-90. Dana H. Allin & Steven Simon, ‘The Moral Psychology of US Support for Israel’, Survival, 45, 3, 2003, pp.123-144. Jonathan Rynhold, ‘Israel’s Fence: Can Separation Make Better Neighbours?’, Survival, 46, 1, 2004, pp.55-76. Uri Bar-Joseph, ‘The Paradox of Israeli Power’, Survival, 46, 4, 2004, pp.137-155. Yoel Guzansky & Amos Yadlin, ‘The Arab World’s Response to an Israeli Attack on Iran’, Survival, 55, 4, 2013, pp.107-120. Paul D. Miller, ‘Evangelicals, Israel and US Foreign Policy’, Survival, 56, 1, 2014, pp.7-26. Charles D. Freilich, ‘Why Can’t Israel Win Wars Any More?’, Survival, 57, 2, 2015, pp.79-92. Eado Hecht & Eitan Shamir, ‘The Case for Israeli Ground Forces’, Survival, 58, 5, 2016, pp.123-148. Charles D. ‘Chuck’ Freilich, ‘Can Israel Survive Without America?’, Survival, 59, 4, 2017, pp.135-150.